> Research Library > Singularity University > The Exponential Leader’s Guide to Disruption shows how to disrupt yourself before someone else does. 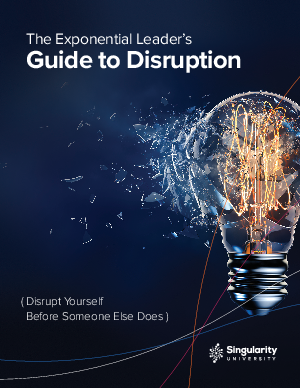 In this eBook, you’ll learn how to lead innovative disruption at your company that unlocks new opportunities and deflects external disruptive forces. You’ll discover more about how “being exponential” can positively impact your leadership style and enable the culture of innovation you need for ideation and innovation to flourish at your organization. We’ll introduce the skills, approaches, and mindset we share with enterprise leaders every day to drive growth and success for their organizations, and bring bold, innovative solutions to market that address some of our world’s biggest, most persistent problems. We reveal the lessons taught by Lotus and Kodak, two companies that failed (spectacularly), in order for you to see the future in time to avoid disruption. We'll share essential do’s and don'ts of disruption to arm you with strategies to employ today and an awareness of key pitfalls to avoid. We'll also explore the "big shift" that the digital economy has already brought to many large organizations. And we'll explain why it's necessary for manufacturing and other industries to become as agile as software companies to survive in what’s being called the fourth industrial revolution. Get the guide now and start learning how to future-proof your business.